Mental disorders cover a wide range of conditions that lead to abnormalities of thought, feeling, and behavior. These abnormalities cause distress or impair a person's ability to function. A man in a tattered coat stands on the street corner, yelling at no one in particular. Although the man appears to think that he is arguing logically, his words are jumbled together and make little sense. In a nearby apartment, a young woman cannot sleep until she is sure that her kitchen stove is turned off. She leaves her bed, checks the stove, and then returns to bed. But can she be sure? Once more, she goes to check the stove, a process she will repeat many times throughout the night. In a suburban home, an 11-year-old boy wakes in a panic. He dashes to his parents' bedroom to make sure that they are safe, gripped by fear that they have been in mortal danger while he slept. What do these three people have in common? While their thoughts, feelings, and behaviors are very different, each has a mental disorder that requires careful diagnosis and can be helped with proper treatment. * psychological means related to the way a person thinks and feels. * behavioral means related to the way a person acts. What Are Mental Disorders and What Causes Them? Doctors and researchers use computer-generated positron emission tomography (PET) scans to study how the brain functions. 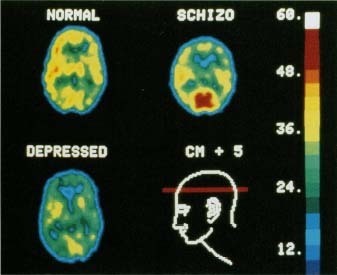 These PET scans compare brain activity in a healthy person (top left), a person with schizophrenia (top right), and a person with depression (lower left). The red line through the diagram at the lower right shows the area of the brain that is depicted in the scans. NIH/Science Source, Photo Researchers, Inc.
from disorders first diagnosed during childhood or adolescence, such as the separation anxiety experienced by the 11-year-old above, to disorders often associated with old age or with medical illnesses, including Alzheimer's disease * , AIDS * , Huntington's disease * , and strokes * . Many mental disorders have been found to stem from changes in the structure or function of the brain. Some disorders also may be related to drug or alcohol abuse. Although the exact cause of most mental disorders is not known, some of these conditions tend to run in families, indicating that inherited or genetic factors may play a role. Among the more common mental disorders are schizophrenia, depressive disorders, anxiety disorders, eating disorders, and sleep disorders. Phobias, such as claustrophobia (fear of closed spaces) and social phobias (fear of embarrassment in social situations), also are classified as mental disorders. * Alzheimer's disease leads to changes in personalify and to a gradually worsening loss of mental abilities, including memory, judgment, and abstract thinking. * AIDS (acquired immune deficiency syndrome) is a viral infection that can lead to damage in many parts of the body, including the brain and nervous system. * Huntington's disease is a genetic condition that leads to involuntary twitching or jerking of the muscles in the face, arms, and legs along with a gradual loss of mental abilities. * strokes are events that occur when a blood vessel bringing oxygen and nutrients to the brain bursts or becomes clogged by a blood clot or other particle. As a result, nerve cells in the affected area of the brain cannot function properly. Anxiety disorders (ang-ZY-e-tee dis-OR-derz) are mental disorders characterized by extreme, unpleasant, and unwanted feelings of apprehension or fear, sometimes accompanied by physical symptoms. Delirium (de-LEER-e-um) is a mental state in which a person suddenly becomes confused and disoriented, perhaps not knowing what day it is or not recognizing a friend. It often accompanies a physical illness and usually goes away when the illness gets better. Delusions are false beliefs that a person clings to, despite their lack of basis in reality. For example, delusion of grandeur refers to the false belief that a person has great importance, power, wealth, intelligence, or ability. Dementia (de-MEN-sha) is a gradually worsening loss of mental abilities, including memory, judgment, and abstract thinking. It is more common in older people. Depressive disorders (de-PRES-iv dis-OR-derz) are mental disorders associated with feelings of sadness, hopelessness, and loss of self-esteem and enjoyment. Significant levels of depression impair a person's feelings, thoughts, and behaviors. Hallucinations are false perceptions by the senses. People hear voices, see visions, or sense things that are not really there. Obsessive-compulsive disorder (ob-SES-iv-kom-PUL-siv dis-OR-der) is a mental disorder that causes people to feel trapped by distressing or senseless thoughts and to feel as if they have to repeat actions. Phobias (FO-be-as) are mental disorders that lead to a lasting, intense, irrational fear of a particular object, activity, or situation. Post-traumatic stress disorder (post-traw-MAT-ik STRESS dis-OR-der) is a mental disorder that interferes with everyday living and occurs in people who survive a life-threatening event, such as school violence, car accidents, natural disasters (earthquakes, hurricanes, floods), or military combat. Psychosis (sy-KO-sis) is a broad term covering severe mental disorders that make a person unable to recognize reality, relate to other people, or function in daily life. A disorder like depression could be considered a neurosis or a psychosis depending on how severe it is. Schizophrenia (skitz-so-FRE-ne-a) is a form of psychosis that causes people to have hallucinations, delusions, and other confusing thoughts that distort their view of reality. Separation anxiety (sep-a-RAY-shun ang-ZY-e-tee) is a mental disorder in which children worry excessively about leaving their homes, parents, or caregivers. How Are Mental Disorders Diagnosed and Treated? Diagnosis of mental disorders requires careful evaluation by a qualified physician or mental health professional. A variety of tests are used. The physician may assess how severe a person's symptoms are, how long the symptoms have lasted, the person's prior mental and medical history, whether the disorder has a medical basis, and whether the disorder is caused by alcohol or another drug. Treatment depends on the specific disorder and may include psychotherapy * for the individual or for the family. Often a combination of psychotherapy and medication is prescribed.